I, of course, collect buttons, and have been for at 4-5 years. I remove them from clothing that has passed its useable life, sometimes I find jars of them at yardsales, and periodically I just find them laying in parking lots, etc. Two weeks ago, from the Abita All-Town Yardsale, I came home with a big bag of 'Vintage' buttons someone else had given up on collecting. SO ... I've been thinking about using some of them in the charm bracelets. I've seen bracelets before using buttons and they are great fun in appearance. Thought I'd start out simple ... beads and buttons ... and then, consider adding in more found objects. I decided to start with white buttons as I have a huge number of these. I'm using chain here I recently purchased. The 1st bracelet went remarkably well; nothing really new, just have to use jump rings in a variety of sizes depending upon the width of the Beads. 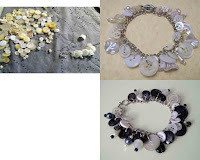 I decided to call it :Buttons and Beads, An Upcycled Braclet in Shades of White. Since this went so well, switched out some of the buttons/beads and completed the second one, which I'm calling "Black & White, An Upcycled Charm Bracelet using Buttons and Beads". (That's one of the hardest parts of having online shops ... coming up with names for the creations). I'm going to list both of these in Artfire ... sooner or later. I'm getting abit behind on processing my pictures and getting the accessories posted. I also started on a third bracelet ... pink with hearts, which I'll finish up tomorrow morning.